Did you know that News Corporation has over 15.5 million unique monthly visitors to their websites, The Washington Post over 10 million, and Yahoo! News over 40 million? Find these statistics and more at Who Owns the News Media from the Pew Research Center’s Project for Excellence in Journalism, an interactive database of companies that own news properties – online, newspaper, magazine, network tv, radio, and more – in the United States. Use the site to compare the companies, explore each media sector or read profiles of individual companies. This entry was posted in Electronic Resources, Investigative Tools, Research Tips, Statistics & Data and tagged news ownership, Pew Research on July 21, 2011 by Cris. What’s dominating the news? Pew has the answer! Pew Research Center’s Project for Excellence in Journalism tracks mainstream media coverage so you can see what’s dominating the news. 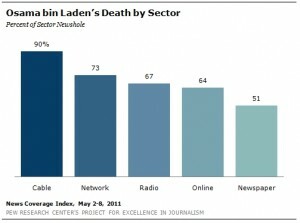 Check out Pew’s News Coverage Index for additional dates and details of news coverage information, going back to 2007. This entry was posted in Journalism/Communications Studies, Statistics & Data and tagged data, news coverage, Pew Research on May 11, 2011 by Cris.